There is really nothing like a pie! I think that a pie is the ultimate winter comfort food; endlessly adaptable, comforting, and with a few cheat ingredients very very easy to make. The simplest pie is a pot pie: a pot of delicious sweet or savoury filling covered with a sheet of pastry and baked. Quick and easy, and with only a pastry topping there are no dreaded soggy bottoms. I can clearly remember both the first, and the last time I made puff pastry – the first was when I was 14 in a Domestic Science (now called Home Economics) lesson at school. The last was several years ago for a challenge. There has been, at most, one other occasion. I think that making puff pastry is a faff, and when you can buy excellent ready made puff pastry there really is no need to make your own. These simple pot pies need only 4 ingredients, two of which are from the freezer (the puff pastry and the frozen berries). I am a great fan of using my freezer for storing ingredients as well as leftovers and some convenience foods. Like many people we led busy lives, we are often away and our plans can change at the last minute. With a well stocked freezer of freshly frozen fresh food I can pull a balanced meal together quickly from ingredients I have in the flat. Frozen food will last for longer, and modern blast freezing techniques mean that fresh ingredients have their nutrients, taste and texture locked in. 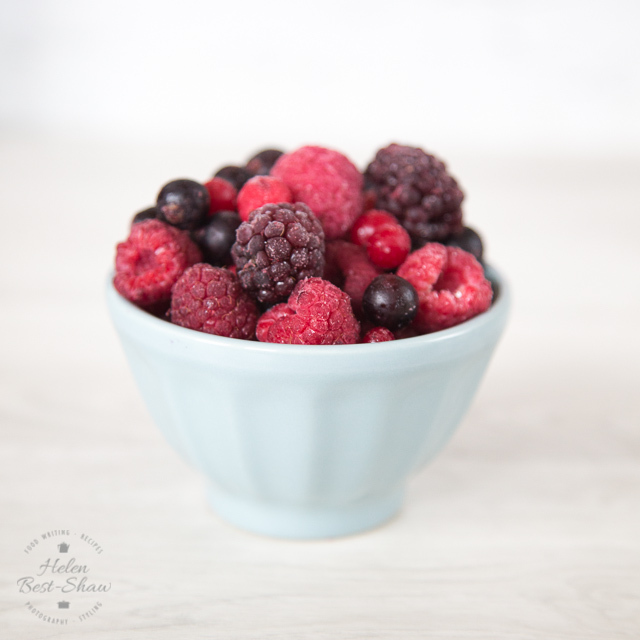 A packet of mixed berries can be used in a fruit pie, in a smoothie for breakfast, made into a compote to top porridge or cereal, or a sauce to serve with ice cream – a simple step towards your 5-a-day – and at £1.50 for a 500g bag considerably cheaper than fresh berries. Puff pastry is such a useful and adaptable freezer staple, I use it regularly as a base for both sweet and savoury tarts, a pie topping, for sausage rolls, hand pies and pasties. Once defrosted wrap any leftovers in cling film and keep in the fridge for a few days. Ideas for using up any scraps are cheese straws, palmiers, pasties, jam tarts, or cut into interesting shapes with a cookie cutter, bake, then serve on soups or casseroles. Many brands of ready rolled puff pasty are vegan – just check the labels when you shop. And of course the perfect alternative to a sweet pie is a crumble so you may like my vegan mixed berry crumble. Or my date and orange cake. 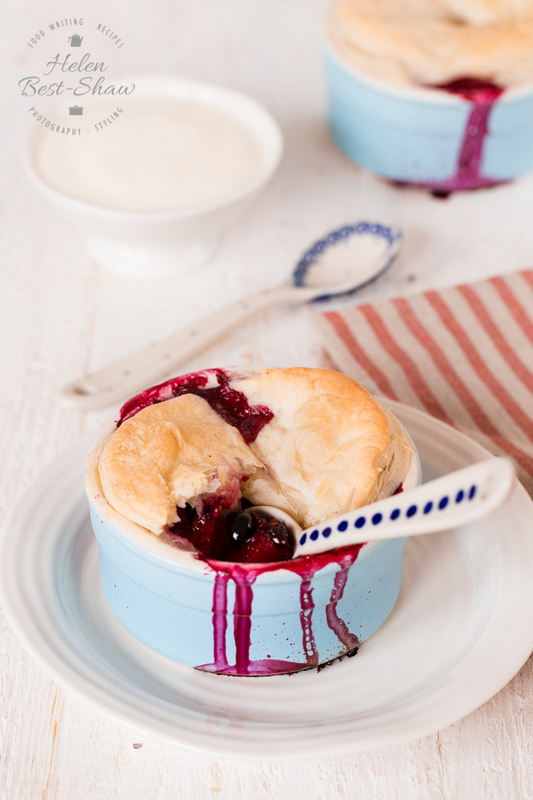 If you try this Easy Mixed Berry & Apple Pot Pies (Vegan) please tag #FussFreeFlavours on Instagram or Twitter. It is amazing for me when for me when you make one of my recipes and I really do love to see them. You can also share it on my Facebook page. Please pin this recipe to Pinterest too! Thanks for reading Fuss Free Flavours! 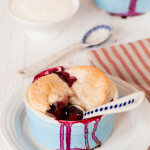 This 4 ingredient fruit pot pie is a twist on the traditional blackberry and apple pie. Vegan too. Place the apples, frozen berries and sugar into a pan, add a little water. Cover and cook over a gentle heat until defrosted and soft. Remove from the heat and divide between 4 individual pie dishes. Sprinkle a little flour on to the worktop and roll out the pastry to about the thickness of a pound coin, cut out pieces to fit the top of the pie dishes. Moisten the edge of the pie dishes with a little water, or diary free milk and top each dish with a piece of pastry, pushing it down on the rim. Use a sharp knife to make a couple of small slits in the top of each pie. Place the pies on a baking tray and bake at 220C / fan 200C / Gas 7 for 15 - 20 minutes until golden and puffed. Serve with non diary yoghurt or cream.